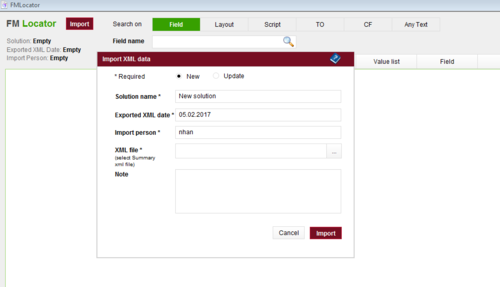 This file is a small FileMaker-based tool whose input is the XML data of Database Design Report exported from Filemaker. It can help developers save time finding elements in a solution. 1. The error of searching a TO in Go To Related Record script step is fixed. 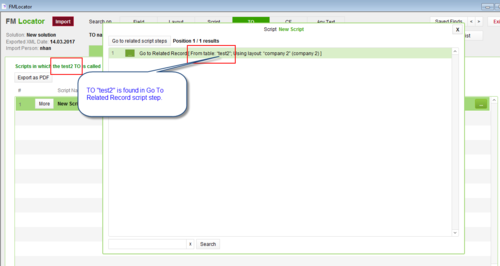 In previous versions, if you want to check if a TO is called in Go To Related Record script step, it can not be found. With the version 1.8.8, this error is fixed. 2. 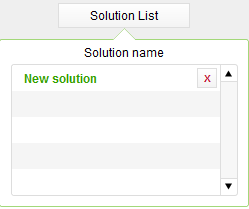 The error of going to next or previous history entry in Search TO Saved Finds list is fixed.